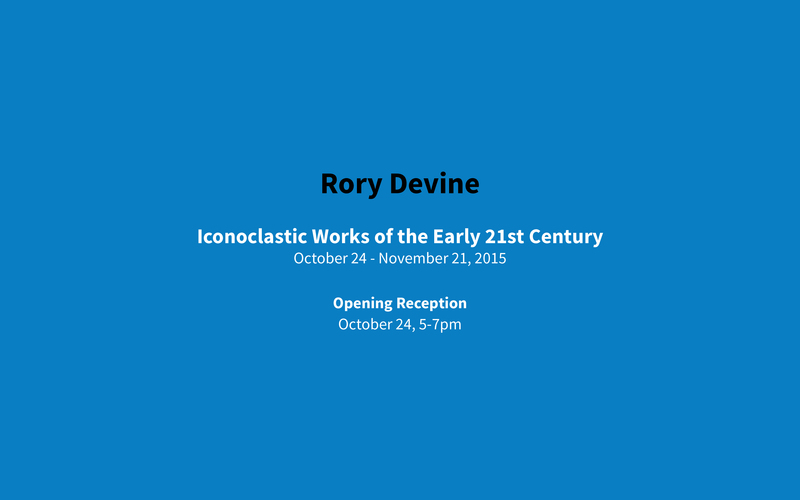 c. nichols project is pleased to present Rory Devine’s solo exhibition: Iconoclastic Works of the Early 21st Century. Devine lives and works in Los Angeles. In this, his first solo project with the gallery he will present new paintings, a unique photographic print and the continued use of balloons as a surrogate. Devine’s work is firmly rooted in the quasi-unhinged present and buttressed up with a sickening sense of the absurd. The work maintains a strong narrative content: content that is firmly tied to the history of contemporary human struggle. Tangential narratives abound but the function of a definitive anchor in "reality" is also thematically apropos. One of the works, Untitled, (There may come a point where you find it necessary to employ allegory and metaphor in order to sufficiently express a predetermined human condition), 2015, suggests multiple meanings. The balloons function as a surrogate audience, but also as homage to sixties design, landscape painting and to classic corporate sendoffs, etc. They work simultaneously as metaphor for the festive lightness of a party turning melancholy outside of such festivities. In conjunction with the balloons, Devine presents an upright but unplugged electric guitar that will be moved around the gallery every day through the course of the exhibition. It seems Devine’s intent is to highlight issues of neutered (or castrated?) masculinity, acknowledgement of the fetish: the hard edge curves of design contrasting with the feminine voluptuous and vulnerable forms of the balloons. And once again Devine’s work possesses an enigmatic and haunting quality, subtext bounces around in the background attempting to snag the viewers attention (perhaps in vain), which the ultimately laborious and facile technique acts as (futility – it all comes down to subjectivity) seduce its witness. Or, for additional information and press inquiries please contact Christine Nichols or Justin Cavin at the gallery: info@cnicholsproject.com.